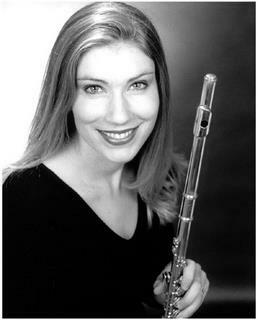 Julie Long (flute) Is an active freelance flutist in the Los Angeles area. She has performed with the Los Angeles Philharmonic, Los Angeles Music Center Opera Orchestra, Pacific Symphony, Pasadena Symphony, Long Beach Symphony, Los Angeles Master Chorale Orchestra, Joffrey Ballet Orchestra, Ojai Festival Orchestra and others. She recently became a member of the Riverside County Philharmonic Orchestra after winning the second flute audition in the Fall of 2005. As a flutist in the recording studios she has played on many motion picture soundtracks, including Dreamgirls, Meet the Robinsons, and Superman Returns. In addition to playing new music with Ensemble Green she also plays early music on wooden Renaissance and Baroque flutes. Sought after as a teacher, Julie is flute professor at Long Beach City College, flute coach for the Idyllwild Arts Summer Program and maintains a private flute studio at her home in Lakewood. She is the former principal flutist of the American Youth Symphony and Young Musicians Foundation Debut Orchestra and was one of six finalists in the National Flute Association Young Artist Solo Competition in 2000 and 2002.